The Surrey Arms Public House, Morden Road, Mitcham, CR4 4DD. As of January 2018, it is still a pub. 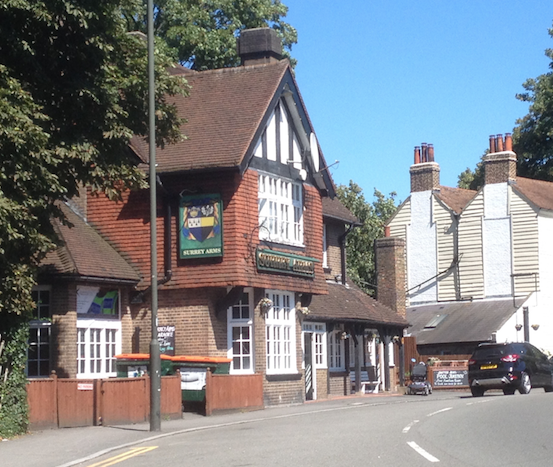 It is the only remaining ‘arms’ pub in Mitcham that still displays a coat of arms. Owner Admiral Taverns Ltd (Company Registration No. 5438628) of Milton Gate, 60 Chiswell Street, London EC1Y 4AG, who bought the freehold, title number SGL105751, for £490,000 on 28th January 2012. EVERY pub’s different – that’s what makes them so nice. But the Surrey Arms in Morden-road, on the Morden/ Mitcham border, is not so much a pub with a difference as a difference in the pub. The place has a split personality. One half’s as cosy as your sitting room and the other like an amusement arcade. But readers who’ve now decided to try elsewhere for their pint tonight, should read on. For the two halves are strictly separate and that’s the reason for the success of the Surrey Arms. From the outside it looks like an old country house, complete with oak beams and a long sloping roof to a cute little porch. There’s a small car park and one or two tables and chairs. The whole impression is that the oak beams will be repeated inside, there’ll be a roaring log fire and brasswork everywhere. Not so, the saloon bar is decorated just like a hundred local sitting rooms. There’s a cosy patterned carpet, plastic flowers bloom eternally in the net curtained windows and even the juke box looks like a radiogram and plays only soft ballads. Four friendly cats lean against the legs of relaxed customers and you get the impression that instead of leaving their own tankards behind the bar, regulars should trust the landlord with their pipes and slippers. The licensee, Charlie Whyte, is content that it should be so. As a Scotsman, he had pretty strong ideas about pubs. “I like people to just pop in for a drink,” he said. “Knowing all the customers’ names makes it worth while.” He’s an enormous man with a flourishing beard and a beer-drinker’s figure. A man who looks at home behind a bar. “I was a brewery engineer,” he explained. “taking a pub was a natural progression. But this isn’t like the pubs back home on the Clyde. They’re just drinking shops up there and if you do see a woman in a public bar . . well, she’s a loose woman. Of course, the homely atmosphere is mainly for when the locals pop in during the evenings but there’s still a good trade at lunch time and the little varnished tables are carefully laid up with paper mats. The menu is different every day but there’s liver and bacon, chips or beans for 30p, a veal and ham pie salad at 33p or a ham sandwich at 16p. Even then there’s an atmosphere of businessmen shedding the cares of the office as they come through the door. You can’t stay tense in the saloon bar of the Surrey Arms for long. But in the public bar things are very different. The ceiling is painted an impossible cherry red, there’s nondescript grey lino on the floor and a long mauve bar. The room is large and runs mostly to an enormous assortment of machines. Theres a pin table, a football table, a TV, tennis machine and a huge garish juke box playing pop. The regulars have invented several different sets of rules for the small American pool table and if anyone’s still feeling bored, there’s a colour television. There were several rude remarks from the older generation who looked on it all as desecration and complained that there was barely room for the red topped tables and assorted chairs. Even the darts players complained half heartedly that all the clicking and pinging wasn’t so good for concentration. Oddly enough, not one of the crowd happened to be a pinball fanatic, but Charlie Whyte said the machines went well down and paid their share of the profit. The only thing that’s due to move out of the public bar is the pub piano. No one’s been playing it lately so Charlie’s given it to a local old peoples club. But somehow it seems impossible that the Surrey Arms will ever change – so comfortably set in its ways – the sort of local that’s been the same for a while and will stay pretty much the same for a while longer.